Sept. 22, 2015, 1:48 p.m.
It’s easy to get a little myopic and forget that not everyone has the same access to mobile phones or smartphones or even the Internet. 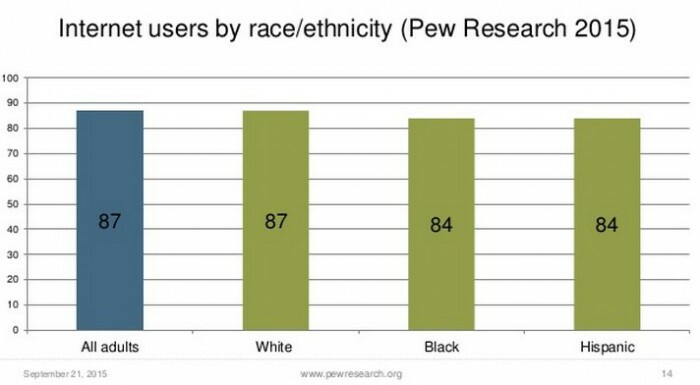 Internet usage across demographics has increased over the past 15 years or so, but there are still some notable divides, as Pew’s Lee Rainie pointed out in a presentation to the U.S. Census Bureau’s National Advisory Committee on Racial, Ethnic, and Other Populations. Rainie’s presentation used a variety of data points from over 15 years of research, but together it’s a nice reminder that not everyone is an iPhone user worried about clogged LTE networks. Here is, for instance, a graph showing the increase in Internet users since 2000, by household income. 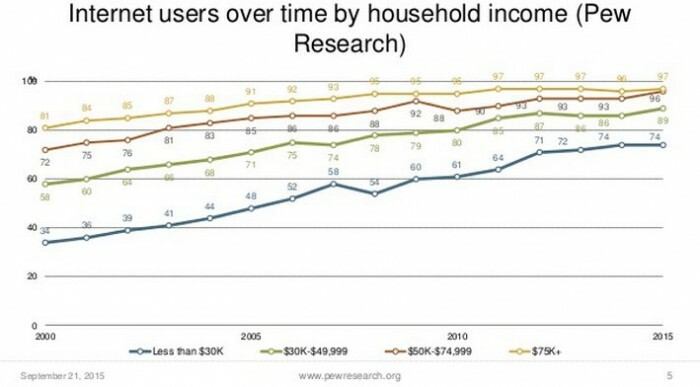 One quarter of those making $30,000 or less don’t use the Internet at all. 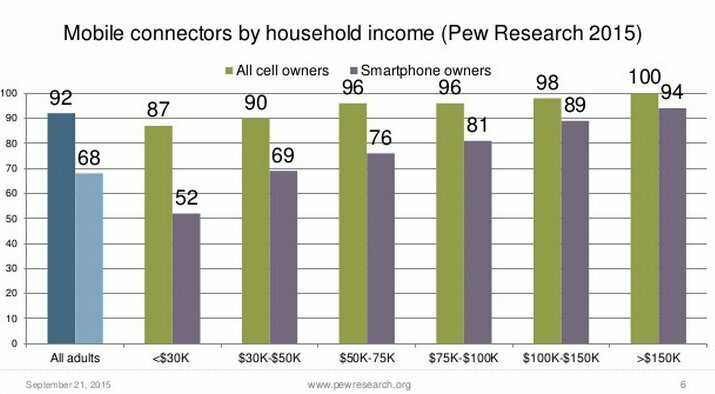 Here’s a closer look at the marked difference in smartphone ownership between those with higher and lower household incomes. Other takeaways from the presentation include some insight into why some people don’t use the Internet: Some of the major barriers, Pew found, were lack of access to a computer, the learning curve, as well as physical disabilities. You can view the full set of slides from Rainie’s presentation over at Pew. Wang, Shan. "Pew reminds us that the broadband-enabled, smartphone-driven world you probably live in isn’t universal." Nieman Journalism Lab. Nieman Foundation for Journalism at Harvard, 22 Sep. 2015. Web. 25 Apr. 2019. Wang, Shan. "Pew reminds us that the broadband-enabled, smartphone-driven world you probably live in isn’t universal." Nieman Journalism Lab. Last modified September 22, 2015. 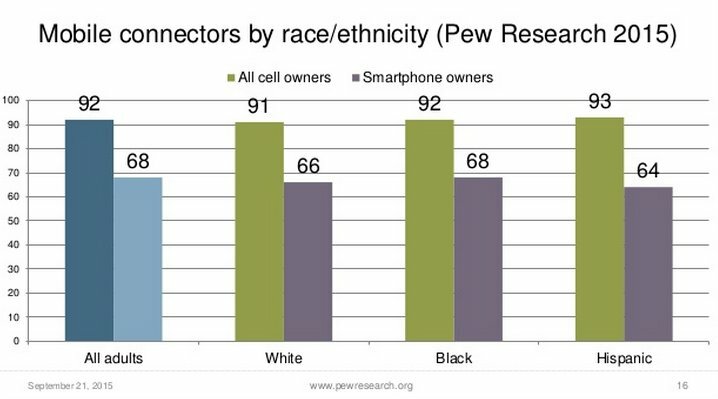 Accessed April 25, 2019. https://www.niemanlab.org/2015/09/pew-reminds-us-that-the-broadband-enabled-smartphone-driven-world-you-probably-live-in-isnt-universal/.